In the run up to our Japan trip I'd avoided telling Megan exactly where we were going, but I did provide a number of hints. One of those was "Rocky Mountain", which she assumed to be a reference to Rocky Mountain Construction, the American company that has produced several outstanding coasters in recent years. I'd expected her to look at potential trip locations with RMC coasters, but she was absolutely convinced that my plans involved a trip to Asia, and thus she decided instead to research whether there RMC had been involved in any buildings on that continent. Given her tenacity it's mildly surprising that she never spotted that there was a park in Japan whose name literally translates to "Rocky Mountain Park Land". The approach road gave us a first look at Pop Spin Coaster (#2174), built by Hoei Sangyo in 1981. The ride originally operated with a standard sit-down train, but it was refitted in 1998 with six spinning cars that represented the manufacturer's first foray into the genre. Their inexperience was clear to see in the design, with each seat featuring a restrictive seatbelt in addition to a heavy overhead restraint, but despite the somewhat clunky nature of the hardware, the ride experience was decent enough. The overhead restraints only lock after dispatch as the train engages the lift hill. This unusual feature is quite disconcerting for those accustomed to riding coasters, and probably accounts for the presence of a backup seatbelt, as there would be no guarantee that a failure would be detected in time to execute an emergency stop. The spinning mechanism is released at the same point, and the cars begin to rock from side to side as they climb slowly to the apex. There is a dramatic lurch as the train disengages, followed by a short drop into a tight helix, two bunny hop hills without airtime, and a turn back to the station where a rather unforgiving straightening mechanism resets each car to face forward. The tracking is not as smooth as it might be, but a little license is perhaps allowable for a thirty-four year old ride on the side of a mountain in an earthquake zone. The level of spinning was variable but still more than enough to satisfy. There are only two real criticisms; first, the ride was far too short, coming in at just twenty seconds from top of lift to brakes. Second, the layout was quite frankly dull; I can't think of any other spinning coaster with an out-and-back layout (helix notwithstanding) and there's a good reason for that; a few turns from side to side would have made things far more interesting. Our second single helix powered coaster in as many days was also not from Zamperla. Dragon had some lateral forces but was basically forgettable. We were given three laps for our tickets, two more than we really needed. We also tried a walkthrough Haunted House that had a lot of potential, but fell flat due to a few poor quality scenes. It felt to me like the designers had invested the lion's share of their budget into a subset of the available space, leaving little to nothing for the remainder. 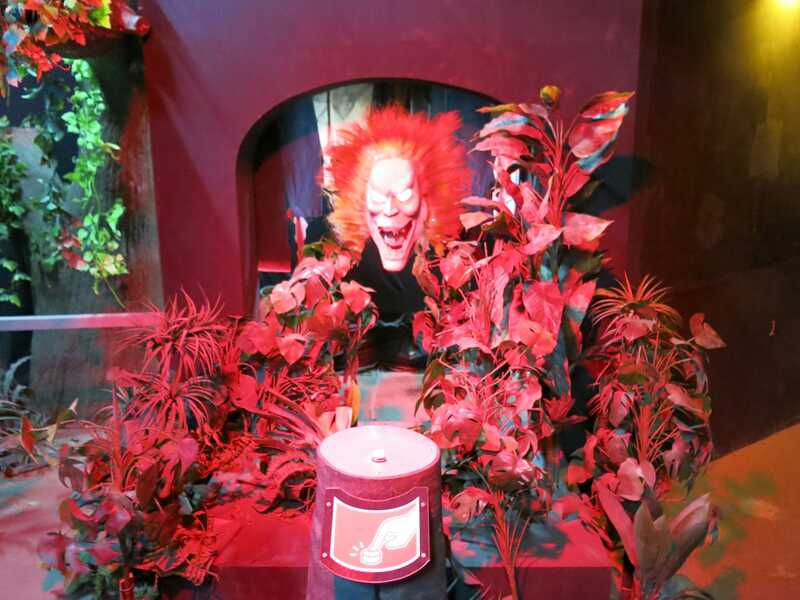 The final room was particularly embarrassing, as the electrical wiring for a pair of animatronics was clearly visible, including a plug socket on the wall, a four way adapter, and two step-down transformers. We concluded our visit with a lap on the twenty-car BFOFW and a second lap on the coaster. One of the wonderful things about the train network in Japan is that travelling on it is normally an order of magnitude faster than driving while also being somewhat cheaper, in sharp contrast to the long distance routes available in my home country of Ireland. The journey from Morioka Station to Hachinohe Station was just twenty-seven minutes by Shinkansen, a vast improvement over the estimated two hours it would have taken us by road. 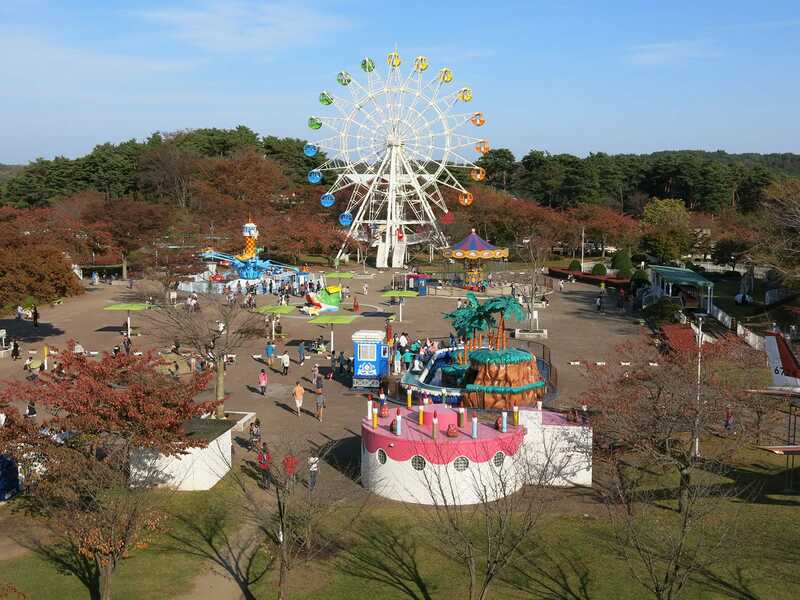 The park is a large public garden with open lawns, a fountain, and a pleasant tree-lined path leading to a small collection of amusement rides, the vast majority geared at children. A retired twin-engine propeller aircraft of unspecified provenance stands on a plinth in one corner, complete with a small set of steps to allow children to look inside. There was no unlimited ride deal on offer, but tickets were inexpensive, with a sheet of eleven available for ¥1100 (~€9). Jet Coaster (#2175) didn't look like it would be up to much, given that it had a footprint roughly twice the size of a Wacky Worm. 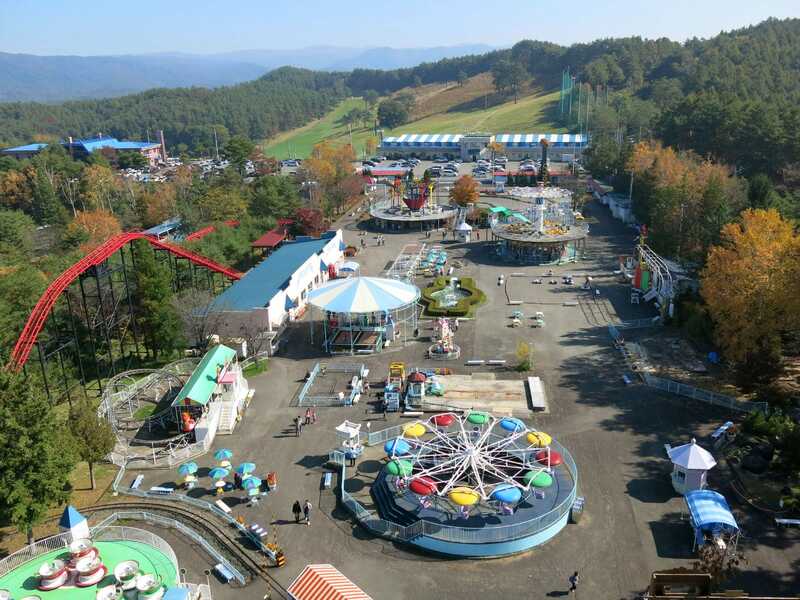 Despite appearances, however, it proved unexpectedly forceful, delivering airtime, laterals, and a lively ride experience that went far beyond what either of us would have predicted. The train, which looked like something from a PTC wood coaster, had more than enough room for two western adults to sit side by side. It was impossible to resist going back for a second lap. There was one really interesting operational quirk on the twenty-car BFOFW at this park, namely the fact that the doors were left wide open on cars that were not loaded with people. This was presumably a crude (but fundamentally effective) way to make sure that they didn't get too hot in the baking sun. Unfortunately the door on ours was left resolutely shut, and a wire mesh across each window made it difficult to get good photographs. The third and final stop of the day was at an indoor family entertainment centre located in the Lapia Mall, a short taxi ride from Hachinohe Park. The place was crowded when we arrived but there was absolutely no sign of a roller coaster; the visible area we could see was mostly occupied by arcade machines, with only a monorail, a train ride, and a pirate ship to be seen. 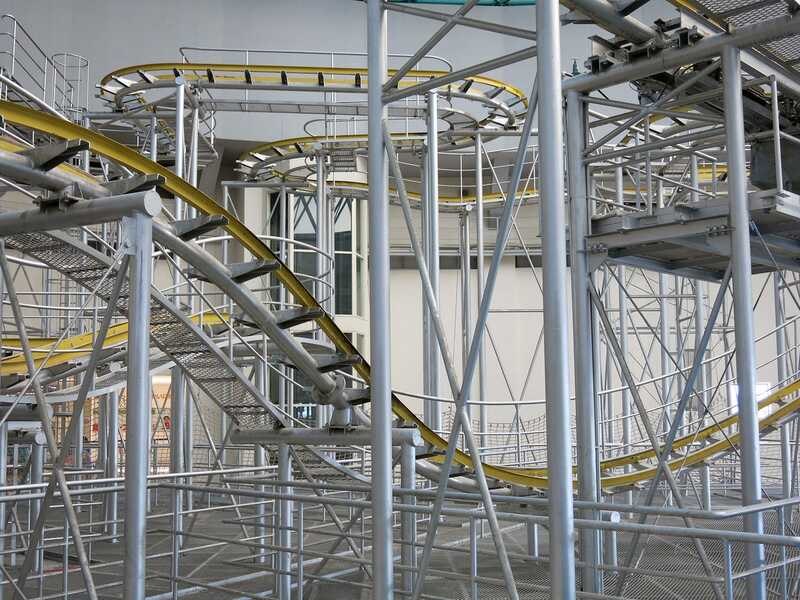 It was only after climbing several flights of stairs that we found what we were looking for in Hyper Kid Coaster, a Togo-built Wild Mouse suspended in the rafters high above everything else. It was immediately apparent that we'd found the ride in an advanced state of non-functionality. Closer inspection revealed that this wasn't a temporary situation; the lift chain looked like it hadn't moved in months, if not longer, and the station had been repurposed for storage. Both the entrance and exit ramps had been blocked off with vending machines, and just in case there was any doubt, a sign nearby indicated closure due to an error in the machine. There was nothing else to be done, so we walked ten minutes to the nearby Konakano Station from where we caught a shuttle back to Hachinohe, where we transferred to an early train back to Tokyo.